The Camino de Santiago is a pilgrimage through Spain to the Cathedral in Santiago de Compostela, to the shrine of St. James. It is also called The Way of St. James. There are several paths that can be taken to get there, some beginning in France or Portugal, all of them culminating in Santiago at the Cathedral. At the beginning of May, after 9 months of training and planning, we set out for a ten day pilgrimage on the Camino Frances, a route that goes through the northern part of Spain. We were part of a group of 11 people, mostly parishioners of Holy Cross Episcopal Church in Sanford, Florida. We began our walk in Ponferrada, Spain, and walked for nine days over many different terrains. We climbed up and down mountains, walked through beautiful forests, across farmlands, along rivers and through villages both large and small. It was a rigorous hike much of the time, so we took our time, stopping to rest often, drinking delicious cafe con leche at little markets and rural cafes. We hiked an average of 15 miles a day, one day as long as 22 miles. It was exhausting but the group encouraged each other and a wonderful comradery grew each day between us. We also met people from all over the world who were hiking The Way. We learned that there are many reasons that people make this pilgrimage, some for fitness, some for a love of travel, but mostly as a spiritual pilgrimage. For us, it was a chance to be together as father and daughter, to spend time in prayer as we walked, to grow closer to and rely more on Christ as we experienced creation in a new and challenging way. 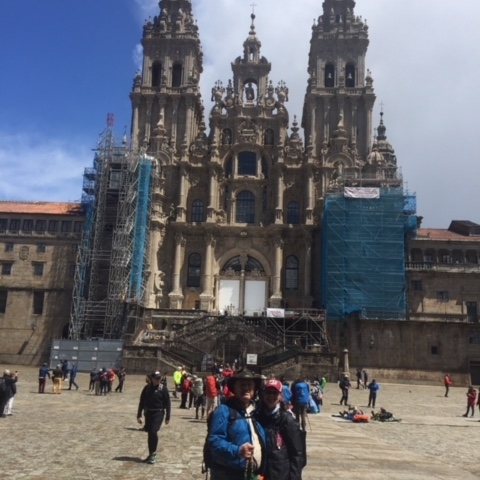 It was an amazing trip, and after a total of over 150 miles, we reached Santiago and the Cathedral and worshipped at the Pilgrim Mass, giving thanks to God for safe travels and all the blessings in our lives.